Firkin Fest returns to Headquarter Beercade’s new River North location (213 W. Institute) on Sunday, March 29, 2015. Capacity Bar Group announces the return of an event of epic ale proportions. For the second year in a row, Headquarters Beercade will host Firkin Fest, a unique tasting event that celebrates the city’s craft beer community. Last year’s sell-out event was attended by over 500 brew buffs and this year’s battle will be even bigger than before. 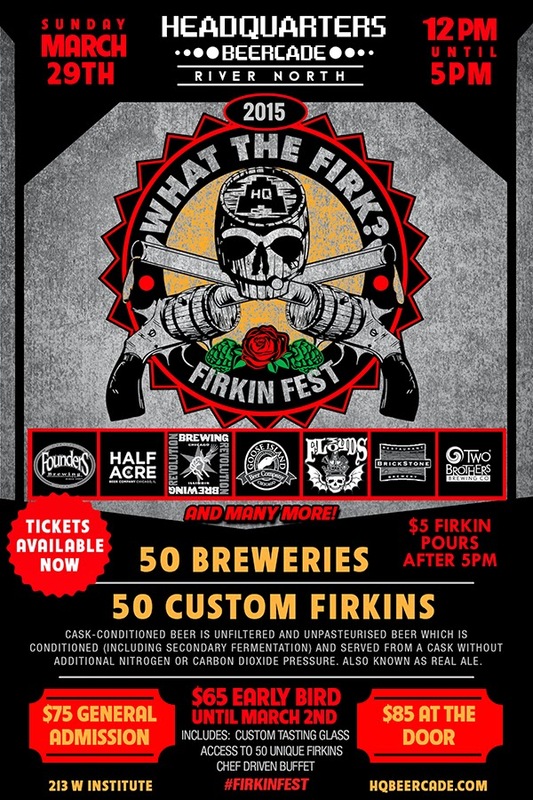 So, what in the firk is a firkin? It’s considered “real ale,” one that is cask conditioned but has not been cold-filtered, pasteurized, or carbonated by outside equipment. The cask barrels preserve the taste in its most wholesome state, while the interior beer harbors active yeast, which means the flavor profile will evolve over time. At Firkin Fest, craft beer connoisseurs will have the chance to taste fifty unique brews through an unadulterated process of consumption. Top breweries will battle in a fight for the finest firkin with ales that have never been sipped before – and may not be savored ever again! 50 Breweries - 50 Firkins! Sip on offerings crafted by a variety of vendors, including Illinois favorites: Goose Island Beer Co. (winner of the 2014 Firkin Fest “People’s Choice Award;” Chicago, IL); Begyle Brewery (Chicago, IL); Desthil (Normal, IL); Half Acre Beer Company (Chicago, IL); Metropolitan Brewing (Chicago, IL); Off Color Brewing (Chicago, IL); Penrose Brewing (Geneva, IL); Revolution Brewing (Chicago, IL); Solemn Oath Brewery (Naperville, IL); and Two Brothers Brewery & Taphouse (Warrenville, IL). Respected regional breweries will also include: 3 Floyds Brewing Co. (Munster, IL); 3 Sheeps Brewing Co. (Sheboygan, WI); Brewery Vivant (Grand Rapids, MI); Green Flash Brewing (San Diego, CA); Founders Brewing Co. (Grand Rapids, MI); Left Hand Brewing (Longmont, CO); Oskar Blues (Lyons, CO); Surly Brewing Co. (Brooklyn Center, MN); SKA Brewing (Durango, CO); Tyranena Brewing (Lake Mills, WI); Vander Mill Brewery (Spring Lake, MI); and Victory Brewing Company (Downingtown, PA). Attendees can enjoy their fill of firkins, but only one firkin will command the crown of the “People’s Choice Award” at the end of this satisfying Sunday. In addition, guests can mingle with an esteemed panel of hand-picked industry and media experts. From beer bloggers to brewery reps, this event will be packed with top ale professionals from Chicago and beyond. Advanced General Admission Tickets are $75 and can be purchased online. Use the code HAILTOTHEALE and receive $10 off your ticket!